Gulf Winds Track Club's 15th annual Potluck Bash 4-Mile Run. 6:00 pm ET. Forestmeadows Athletic Center, 4750 North Meridian Road, Tallahassee, Florida. 2011 story. 2010 story. 2009 story. David Yon, david@radeylaw.com or 850-425-6671. Hot Summer Nights 5K Trail Run #1. 6:00 pm CT. Westgate Park, 801 Recreation Road, Dothan, AL 36303. Larry Dykes, drcprez@yahoo.com or (334) 792-6021. Gulf Winds Track Club / Tallahassee Parks & Recreation Summer Track Series Meet #1. 6:45pm ET. Maclay School track, 3737 N Meridian Rd, Tallahassee, Florida. Tom Perkins, 850-894-2019. Lowndes County 4-H 5K and one-mile fun run. 7:30AM ET 5K / 8:30AM ET one-mile. Lake Park Elementary School, 604 W. Marion Avenue, Lake Park, Georgia 31636. Entry form and flyer. Online registration at Eventbrite.com. Galen A. Mirate, gmirate@gmx.com or 229-561-0747. Watermelon Race 10.2K, 5K, and one-mile fun run. 7:45 AM ET one mile / 8:05 AM ET 10.2K, 5K. Impact Sports & Fitness, 1107 South Greer Street, Cordele, Georgia. Entry form and flyer. Online registration at active.com. Hot Summer Nights 5K Trail Run #2. 6:00 pm CT. Westgate Park, 801 Recreation Road, Dothan, AL 36303. Larry Dykes, drcprez@yahoo.com or (334) 792-6021. Gulf Winds Track Club / Tallahassee Parks & Recreation Summer Track Series Meet #2. 6:45pm ET. Maclay School track, 3737 N Meridian Rd, Tallahassee, Florida. Tom Perkins, 850-894-2019. 34th annual Melon Run 5K. 8:15am ET. Old Jefferson County High School gym, Monticello, Florida. 2011 story. story. 2010 story. USATF certified course #FL06044DL. Entry form and flyer. Online registration at active.com. Jessica Corley, jessicacorley@gmail.com or 850-519-2158. Color Dash and Daddy Diva Benefit Run 10K, 5K, and one-mile fun run. 8:00AM ET 10K and 5K / 9:00AM ET one mile. Earle May Boat Basin, Bainbridge, Georgia. Entry form and flyer. Joseph L. Miller, lotrjmiller@hotmail.com or 229-220-4023. Hot Summer Nights 5K Trail Run #3. 6:00 pm CT. Westgate Park, 801 Recreation Road, Dothan, AL 36303. Larry Dykes, drcprez@yahoo.com or (334) 792-6021. Gulf Winds Track Club / Tallahassee Parks & Recreation Summer Track Series Meet #3. 6:45pm ET. Maclay School track, 3737 N Meridian Rd, Tallahassee, Florida. Tom Perkins, 850-894-2019. 34th annual Hot Trot 5K. 7:30 am CT. Washington-Holmes Technical Center, 757 Hoyt Street, Chipley, Florida 32428. 2011 story. Entry form and flyer. Stan Owens 850-547-2244. Anchors Away 6K and One Mile Fun Run. 8:00 AM CT. Panama City Beach Conservation Park, 100 Conservation Drive, Panama City Beach, Florida 32413. Event page on Facebook. Online registration at active.com. 850-763-7102. Hot Summer Nights 5K Trail Run #4. 6:00 pm CT. Westgate Park, 801 Recreation Road, Dothan, AL 36303. Larry Dykes, drcprez@yahoo.com or (334) 792-6021. Gulf Winds Track Club / Tallahassee Parks & Recreation Summer Track Series Meet #4. 6:45pm ET. Maclay School track, 3737 N Meridian Rd, Tallahassee, Florida. Tom Perkins, 850-894-2019. Dead Lakes Gator Run 10K, 5K, and one-mile fun run. 8:00AM CT. Gaskin Park, Wewahitchka, Florida. Entry form and flyer. Mary Holley, mholley@gulf.k12.fl.us or 850‐639‐2228. Hot Summer Nights 5K Trail Run #5. 6:00 pm CT. Westgate Park, 801 Recreation Road, Dothan, AL 36303. Larry Dykes, drcprez@yahoo.com or (334) 792-6021. 30th annual Greensboro Kiwanis Club's Firecracker 5000. 7:30am ET. Greensboro Town Hall, 150 E 11th Street, Greensboro, Florida. Entry form and flyer. 2011 story. 2010 story. Gulf Winds Track Club / Tallahassee Parks & Recreation Summer Track Series Meet #5. 6:45pm ET. Maclay School track, 3737 N Meridian Rd, Tallahassee, Florida. Tom Perkins, 850-894-2019. Hot Summer Nights 5K Trail Run #6. 6:00 pm CT. Westgate Park, 801 Recreation Road, Dothan, AL 36303. Larry Dykes, drcprez@yahoo.com or (334) 792-6021. Gulf Winds Track Club / Tallahassee Parks & Recreation Summer Track Series Meet #6. 6:45pm ET. Maclay School track, 3737 N Meridian Rd, Tallahassee, Florida. Tom Perkins, 850-894-2019. Ernie Sims Big HITS Family Fun Run/Walk. 7:00PM ET one mile / 7:15PM ET 5K. Tom Brown Park Pavilion #13, Easterwood Drive, Tallahassee, Florida. Alice Sims, alicebsims@comcast.net or 224-5050. Tallahassee Youth Triathlon Series #2. 8:00am ET. Morcom Aquatic Center, Potsdamer Road, Tallahassee, Florida. Event web site. Event page on Facebook. Mike Weyant, weyantm@comcast.net or 850-241-6591. Hot Summer Nights 5K Trail Run #7. 6:00 pm CT. Westgate Park, 801 Recreation Road, Dothan, AL 36303. Larry Dykes, drcprez@yahoo.com or (334) 792-6021. Gulf Winds Track Club / Tallahassee Parks & Recreation Summer Track Series Meet #7. 6:45pm ET. Maclay School track, 3737 N Meridian Rd, Tallahassee, Florida. Tom Perkins, 850-894-2019. Hot Summer Nights 5K Trail Run #8. 6:00 pm CT. Westgate Park, 801 Recreation Road, Dothan, AL 36303. Larry Dykes, drcprez@yahoo.com or (334) 792-6021. Gulf Winds Track Club / Tallahassee Parks & Recreation Summer Track Series Meet #8. 6:45pm ET. Maclay School track, 3737 N Meridian Rd, Tallahassee, Florida. Tom Perkins, 850-894-2019. 3rd annual Run With The Moose 5K and one-mile fun run. 8:00AM ET one mile / 8:15AM ET 5K. Quincy Moose Lodge, 1831 W. Jefferson St., Quincy, Florida 32351. 2011 story. 2010 story. Entry form and flyer. Dawn Mackland, lodge2672@mooseunits.org or 850-294-9317. Hot Summer Nights 5K Trail Run #9. 6:00 pm CT. Westgate Park, 801 Recreation Road, Dothan, AL 36303. Larry Dykes, drcprez@yahoo.com or (334) 792-6021. Hot Summer Nights 5K Trail Run #10. 6:00 pm CT. Westgate Park, 801 Recreation Road, Dothan, AL 36303. Larry Dykes, drcprez@yahoo.com or (334) 792-6021. 3rd annual Trojan Pride 5K. 8:00am ET. Pavilion #13, Tom Brown Park, Easterwood Drive, Tallahassee, Florida. 2011 story. 2010 story. Entry form and flyer. Tanise Jackson tljackson212@gmail.com or Lincoln High School 850-487-2110. Hot Summer Nights 5K Trail Run #11. 6:00 pm CT. Westgate Park, 801 Recreation Road, Dothan, AL 36303. Larry Dykes, drcprez@yahoo.com or (334) 792-6021. Hot Summer Nights 5K Trail Run #12. 6:00 pm CT. Westgate Park, 801 Recreation Road, Dothan, AL 36303. Larry Dykes, drcprez@yahoo.com or (334) 792-6021. 5th annual Robin Lotane Memorial Red Cross Hurricane Run 5K. 8:00 am ET. Southwood Office Complex, Esplanade Way, Tallahassee, Florida. 2011 story. 2010 story. 2009 story. Bob Lotane, 850-545-9446, or Debara Jump, debara.jump@tallyredcross.org or 850-402-5612. Race of the South 10K / 5K / one-mile fun run. 7:30am ET 10K and 5K, 9:00am ET one mile. Moultrie YMCA, 601 26th Avenue Southeast, Moultrie, Georgia 31768. 2010 story. Event web page. Leslie Peretti, leslieymca@hotmail.com or 229-985-1154. Third annual “Running for the bay!” Marathon, Half Marathon, 10K, 5K and 50K ultramarathon. 7:15am ET. Apalachicola, Florida. Race web site. From 2009 to 2011, Chris Rice won Valdosta's first three Memorial Day 5K road races. If anyone could be said to own that race it was Rice. But one sure way to not win a race is to not show up, and Rice was not on the starting line of the Memorial Day 5K on 28 May 2012, ensuring that there would be a new champion. 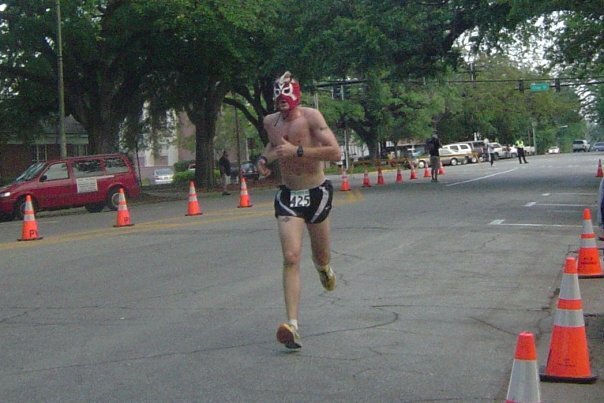 That champion was Valdosta's Masked Avenger, who had been among the many runners finishing behind Rice the previous three years. The Avenger edged out Valdosta's David Burnett for the title, 18:33 to 18:42. Jose Castanon of Hahira took third in 19:51, and O'Renthal Kinsey of Ludowici was fourth in 20:33. The fifth runner and top master was Valdosta's Rick Mazurkiewicz in 20:35. The first female finisher was Alison Peters, a cross-country runner and distance specialist on the track at Lowndes High School, where she will be a junior this fall. Peters finished seventh overall, running the 3.1-mile race in 21:38. At 22:59, the women's runner-up and top woman master was Valdosta's Libby Smith. Rice was not the only runner absent from the fourth annual Memorial Day run. Tropical depression Beryl was blundering through the region, and some runners were perhaps convinced by Goretex-wearing fear-mongers on the Weather Channel to stay home and hide under the bed. 2011 story, "Memorial Day three-peat for Rice in Valdosta"
2010 story, "Blazers Rice and Helton race to victory in Valdosta"
Tropical depression Beryl was bearing down on the Big Bend on Monday, 28 May 2012, the day of the sixth annual Memorial Day 5K Night Run in Bainbridge, Georgia. But Washington’s army hadn’t abandoned Valley Forge because of the weather, nor had the allies postponed the Battle of the Bulge on account of snow. On Memorial Day, with those historical examples to emulate, athletes could hardly be expected to give up a run due to the threat of a little wind and rain. So the race went on, and by the 7:00 PM starting time the only tropical conditions were a few puddles in the streets. Before the runners reached the end of the first mile of the 3.1-mile race, Crawfordville’s Stanley Linton was out front, with Stephen Robbins of Cairo not far behind. It was looking like a renewal of their duel in the 2011 race, where Linton and Robbins had taken first and second. By the halfway point of this year’s race, though, the duel was all but over, with Linton having a commanding lead. He went on to win in 16:17, with Robbins finishing runner-up in 17:08. Donalsonville’s Myles Gibson was the third finisher and the first master, running 18:21. The women’s defending champion, Paula O’Neill of Tallahassee, was trailing after a mile of racing, but during the middle of the race she passed her rivals one by one until she was leading the women’s field. While O’Neill was moving up, though, so was Tiffany Roddenberry. With less than a quarter mile to go, O’Neill and Roddenberry were running side by side going around the last turn on the course. Roddenberry prevailed in the end, 21:46 to 21:52, and the Memorial Day race had a new women’s champion plus a new women’s record. O’Neill was still the fastest woman master in the race, finishing 16 seconds ahead of third woman and second master Debbie Wittmer. 70 athletes finished the 2012 5K Night Run. 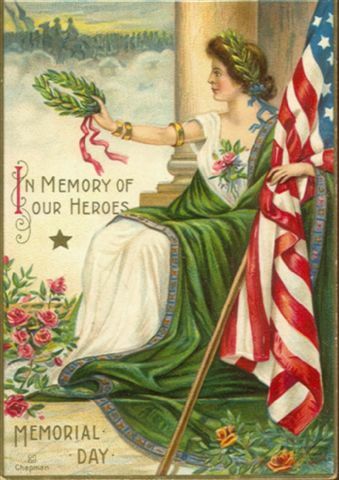 Expect it back on the calendar on Memorial Day 2013. Beryl won't be there next time, though. 2011 story, "Linton and O'Neill fleet in the streets of Bainbridge"
2010 story, "Leitz and Harrell rule the night in Bainbridge"
2009 story, "The Price is Right--Tyler Price's 16:11 wins the Memorial Day 5K"
96 athletes showed up to finish the Blountstown Fire Department's inaugural Catfish Crawl 5K on 19 May 2012. But the fastest runner in Blountstown, Florida that Saturday morning was Wewahitchka's Billy Naylor, who posted a winning 17:45 in the 3.1-mile race. Naylor finished close to 400 meters ahead of the runner-up, Jakob Bidwell, a distance runner on the cross-country and track teams at Wewahitchka High School. A rising junior, Bidwell ran 19:04. Another high school runner, Thomas Howell of Blountstown High, placed third in 19:18. Jerry Manning was the fastest master runner in the race, finishing fourth in 20:13. Hannah Plazarin of Blountstown High was the Catfish Crawl's first female finisher, running 21:41 for ninth overall. Not far behind, the Gulf Winds Track Club's Tiffany Roddenberry was the women's runner-up, putting up a 21:52. The third woman finisher and first woman master was another Gulf Winds Track Club athlete, Judy Alexander, 14th overall in 22:32. The race started and finished near the Depot on Main Street. The course was out and back on a paved rail trail, the Blountstown Greenway Trail, heading south almost to Blountstown's historic landing on the Apalachicola River before reversing direction to return to the Depot. Calhoun-Liberty Journal, "First annual Catfish Crawl 5K reels in a crowd"
2nd annual Fight For Air 5K. 8:00AM ET. Centerville Conservation Community, Tallahassee, Florida. 2011 story. USATF certified course FL11064EBM. Event series web site. Entry form and flyer. Patty Ballantine, eventstallahassee@lungfla.org or 386-2065 x 1141. Georgia can be justly proud of its state parks. Reed Bingham State Park, less than eight miles west of Adel, is a good example. A 1,613-acre park straddling the border of Cook and Colquitt Counties, Reed Bingham features the Little River, a lake created by a 1970 damming of the river, camping, nature trails, and abundant wildlife. Among the creatures that make their home in their park are gopher tortoises, indigo snakes, and (most notoriously) turkey and black vultures. Huge flocks of vultures winter in the park. On a winter evening, if you're walking the nature trail on the boardwalk along the Little River, you'll disturb scores of the winged scavengers in the trees above as they try to roost for the night. And if you look down at the boardwalk, you'll see ample evidence of vulture presence. Vultures are big, and their toilet training is no better than that of any other bird. The park celebrates its vulture with an annual "Buzzard Day" (although any bird watcher will tell you that vultures are not buzzards--right before you throw something heavy at him). In the past, Buzzard Day has been during the winter, when the big birds fill Reed Bingham. This year, though, the vultures didn't get their day till 19 May 2012, when most of them had gone somewhere else. In the past, Buzzard Day included a 10K run on the park's trails. This year, though, it was scaled back to a 5K on the roads. On the plus side, the course was USATF certified (GA11076WC). 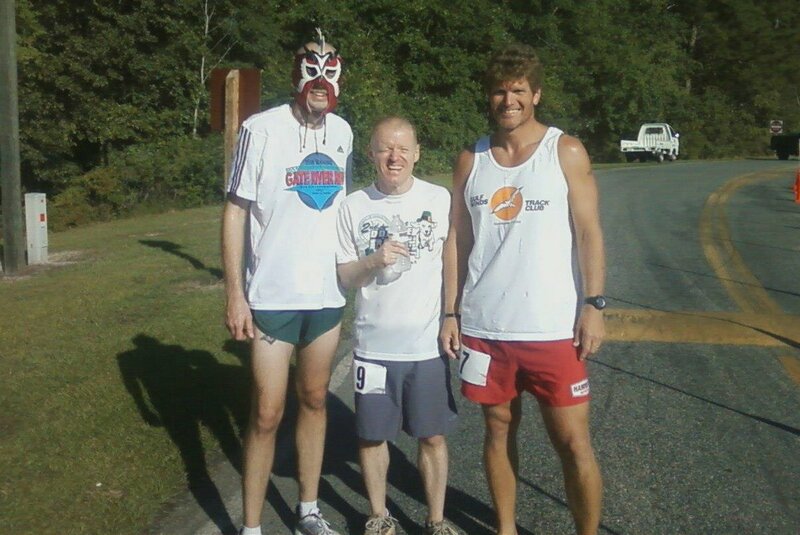 Valdosta's Masked Avenger won the 2012 Road Kill Run, covering the 5K tour of Reed Bingham State Park in 18:34. Tifton teen Samuel Greene was the runner up, finishing nearly 400 meters back in 19:59. In a duel of Tallahassee master runners, Mike Baker beat out Brad Adams for third place and top master honors, 20:53 to 21:04. The first female in the field was Christy Cherry of Moutrie, Georgia; Cherry placed 12th overall in 24:24. The fastest woman master was another Moultrie runner, Lisa Ulakovits, the sixth female finisher and 25th overall in 28:12. 71 athletes finished the race. Looking for another bird-themed race in the Tallahassee region? Try Trouble Afoot! Two weeks before the sixth annual Wakulla Springs 5K, Wakulla High graduating senior Stanley Linton ended Vince Molosky's six-year winning streak at the Tails & Trails 10K. But even though the Wakulla Springs race was right in Linton's backyard, he couldn't stop Molosky from starting a new streak. On Saturday morning, 19 May 2012, Molosky won the Wakulla Springs 5K for the second straight year, breaking his own course record with a 16:49. Trailing by nearly 80 meters, Linton finished second in 17:04. Mike Peymann cracked the top ten to take the top master spot, placing 10th in 19:25. Tallahassee's Angela Wable ran 21:53 to finish as the top woman in the race, edging out another Wakulla High athlete, Cora Atkinson. Atkinson posted a 22:15, finishing as the female runner-up. Fran McLean was the fastest female master and fifth female finisher, running 23:31 for 50th overall. 256 athletes completed the 3.1-mile race. Although it starts on the pavement, the Wakulla Springs 5K is almost a cross-country race, mostly run on the sandy trails of the Sanctuary of Wakulla Springs State Park. The Sanctuary is usually closed to visitors, but for the last six years runners have been welcomed onto the trails the morning of the Wakulla Springs 5K. After leaving the paved park roads, the course parallels the Wakulla River on its downstream journey. Somewhere around the halfway point, the route turns onto a trail even closer to the river and takes the runners back upstream to the finish line. The Sanctuary is home to many species of wildlife, although most runners report only encountering ticks and deer flies. 2011 story, "Molosky and Gutierrez break records at Wakulla Springs"
2010 story, "Sand and 'Skeeters at the Sanctuary of Wakulla Springs"
Detective David White Memorial 5K. 9:00am ET. 444 Appleyard Drive, Tallahassee, Florida 32304. Online registration at RunSignUp.com. 2nd annual Leon Volleyball 5K Pride Stride. 8:00 am ET. Leon High School, 550 East Tennessee Street Tallahassee, Florida 32308. Entry form and flyer. Angie Strickland, 850-443-1000. 6th annual Run for Wakulla Springs 5K Trail Run and 1 Mile Fun Run. 8:00 am ET (one mile), 8:30 am ET (5K). Wakulla Springs State Park, 550 Wakulla Park Drive, Wakulla Springs, Florida 32327. 2011 story. 2010 story. Entry form and flyer. Online registration at RaceIt.com. Ron and Cynthia Christen, 850-926-7834 or 850-567-0500. 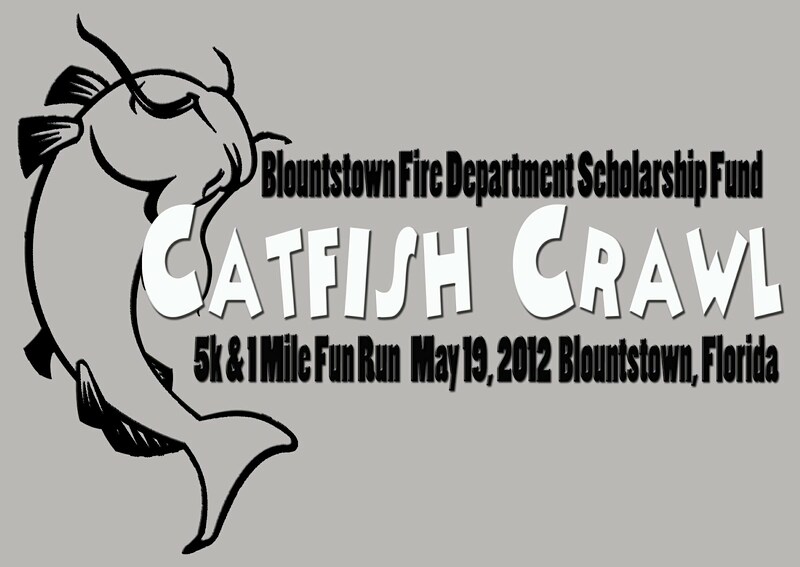 Catfish Crawl 5K and one-mile fun run. 8:30 am CT. M & B Train Depot, North Pear Street, Blountstown, Florida. Event web page. Entry form and flyer. Online registration at active.com. Ben Hall, firechief@blountstownfire.org or 850-674-4988. Road Kill 5K. 8:00am ET. Reed Bingham State Park, 542 Reed Bingham Road, Adel, Georgia 31620. USATF certified course GA11076WC. Online registration at RunSignUp.com. Tallahassee Youth Triathlon Series #1. 8:00am ET. Morcom Aquatic Center, Potsdamer Road, Tallahassee, Florida. Event web site. Event page on Facebook. Mike Weyant, weyantm@comcast.net or 850-241-6591. 2nd annual Fight For Air 5K. 8:00AM ET. Centerville Conservation Community, Tallahassee, Florida. 2011 story. USATF certified course FL11064EBM. Event seriesE web site. Entry form and flyer. Patty Ballantine, eventstallahassee@lungfla.org or 386-2065 x 1141.